The 1942 Liberty dime was minted during turbulent times in the United States with Americans fighting in World War II. All Liberty dimes produced from 1916 to 1945 are sought after by collectors because of the intricate design symbolizing freedom in America. The Liberty dime design was one of two coin designs awarded to German-born sculptor Adolph A. Weinman. 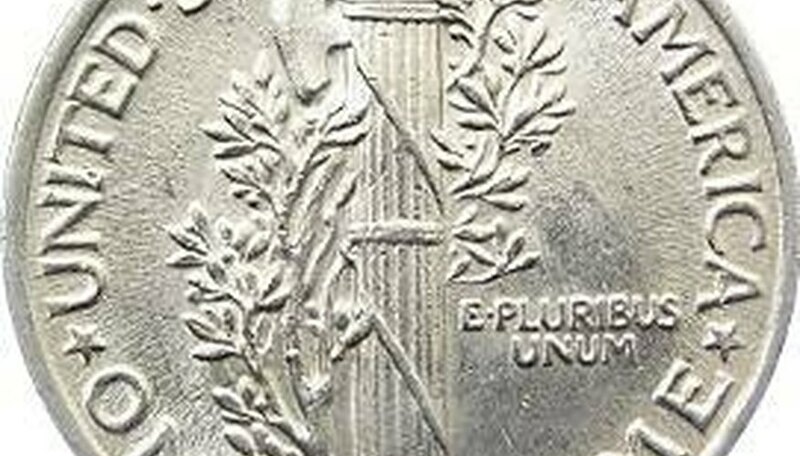 Weinman also designed the walking Liberty half dollar. Liberty dimes were produced from 1916 to 1945. This design was replaced in 1946 by the Franklin D. Roosevelt design to honor his influence in the March of Dimes. Liberty dimes were produced in all three Mints, but the Denver and San Francisco Mints produced fewer than 10 million pieces each year during production. Although the Liberty dime series is nicknamed the Mercury dime series, the mythological messenger is not featured on the coin. The obverse side features Lady Liberty with a winged cap. Most Liberty dimes from 1942 are worth $3 to $4 as of August 2009. A mistake at the Denver and Philadelphia Mints in 1942 produced Liberty dimes marked with a 1942/1 overdate worth more than $300 in good condition and up to $1,400 in uncirculated condition. Brilliant proofs also exist for 1942. Terri Deno is a freelance writer living near Indianapolis. She holds a B.A. in English from Ball State University. She has a passion for research; this passion is the driving force for writing about antiques, literature, genealogy, shopping and travel. How Much Is a 1942 Silver Half Dollar Worth? How Much Money Are Wheat Pennies Worth? How Much Is a 1976 Liberty Silver Dollar Worth? How Much Are Susan B. Anthony Coins Worth?